A UFO exploded in mid air – showering a small Vietnamese island with metal-like debris. The unidentified flying object is NOT believed to be a plane as none have been reported missing in the area. Investigators are working on the theory the explosion happened five miles above the ground. 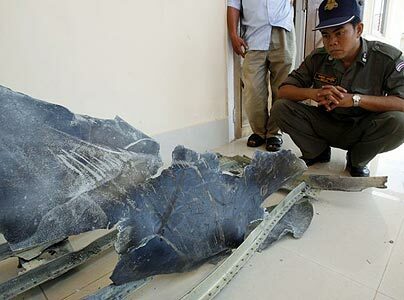 A search of Phu Quoc island off southern Vietnam uncovered shards of grey “metal” up to four feet long. Soldiers combed the area for clues yesterday as airlines in Vietnam, Cambodia and Thailand insisted none of their aircraft were missing in the area. Villagers in the nearby Cambodian province of Kampot said on Tuesday that they had heard a loud explosion. A day later they found chunks of material near the coastline. After the explosion Kung Mony, of Cambodia’s Air Force, claimed it could have been a foreign plane but he later backed down from the theory. One explanation could be that the plane was a military one – but none of the nearby countries has admitted to losing any aircraft. Meanwhile, British UFO experts claim to have found fresh evidence of alien spacecraft flying over BIRMINGHAM. A photographer captured images of three disc-shaped objects shooting through the skies above the West Midlands city. The UFO spotter snapped a similar, lone spaceship days before. It was only when the photographs were put on to computer that the cameraman realised he had taken the amazing images. The cameraman, who captured the three mystery craft on April 24, said he had no idea why the aliens would want to make TWO visits to Brum. HANOI (Reuters) - An unidentified flying object exploded in mid-air over a southern Vietnamese island, state media said Wednesday, a day after Cambodia's air force retracted a report of a mysterious plane crash. Villagers in Kampot said Tuesday that they had heard a loud explosion. Wednesday they told Reuters they had found small chunks of metal near the coastline. Kung Mony, deputy commander of Cambodia's Air Force, said Tuesday he had been told of a foreign plane crashing in Kampot province, but later backed off his claims of an aircraft accident. A UFO is being blamed for a mysterious mid-air explosion over Vietnam. Islanders on Phu Quoc, close to the coast of Cambodia, heard a loud bang and saw shards of metal up to 5ft-long raining down on them on Tuesday morning. Local armed forces and volunteers were mustered to help rescue any survivors, believing there had been a disaster. Officials estimated that the incident had happened around five miles up but airlines in Vietnam, Cambodia and Thailand were contacted and all said they had not lost a plane. The island's military chief Col Nguyen Van Qui described the craft as an "unidentified flying object" according to Vietnam's state news agency. Amid confusion over what had happened, the deputy commander of the Cambodian air force Kung Mony said he understood that a foreign plane had crashed in the Cambodian province of Kampot but later retracted the suggestion. Villagers in Kampot said they had also heard a loud explosion and found small chunks of metal near the coast. One possibility is that a military aircraft taking part in a secret mission exploded but its country of origin has not claimed it. The theory was given some weight by the Vietnam News Agency (VNA) report which said: "The explosion happened at about 8 km above the ground, and perhaps it was a plane, but authorities could not identify whether it was a civil or military aircraft." HANOI • It's a mystery puzzling islanders in southern Vietnam: they heard an explosion, saw something burning in the sky, and found shards of metal debris-but quite what it was, no one knows. A plane? Possibly. An official in nearby Cambodia reported on Tuesday that a small plane had crashed in its southern Kampot province, only to retract his comments later. But Cambodia's civil aviation authority said that airlines denied missing any planes and there was no trace of any crash. Still, the reports from Phu Quoc Island-situated within sight of Kampot-do point to something, according to military and provincial officials. The state-run Vietnam News Agency, quoting the island district's military chief Colonel Nguyen Van Qui, reported yesterday that "an unidentified flying object exploded at about 10am on May 27 over the northern part of Phu Quoc Island." When residents found metal debris, district authorities said they contacted airlines in Vietnam, Cambodia and Thailand but did not receive immediate news of any missing aircraft by late Tuesday, said VNA. "We have informed the ministry of defence," Dinh Khoa Toan, deputy chairman of the island's people's committee said. Reports from the Russian Pacific Fleet’s flagship Varyag [pictured 1st left], known as the ‘killer of aircraft carriers’, is reporting to the Kremlin today that one of the United States most secret aircraft called the SR-91 Aurora [pictured 2nd left] was ‘blasted’ out of the skies over South East Asia by a US Naval ship operating in International waters off the coast of Vietnam. “An unidentified flying object exploded in mid-air over a southern Vietnamese island, state media said on Wednesday, a day after Cambodia's air force retracted a report of a mysterious plane crash. Russian Military Analysts further report that the trajectory of the doomed US space-plane shows it had left the vast American Military base in the Indian Ocean called Diego Garcia and headed towards the Pakistan-Iranian border before its being shot out of the sky. Since an explosion [last picture on left] last week in an US Navy Intelligence Satellite Communication Center located in a hotel near the vast American Naval Base in San Diego, California, that virtually ‘decapitated’ their ability to ‘oversee’ US Air Force activities in the Indian and Pacific Oceans, Russian Military Analysts speculate that the shooting down of the SR-81 Aurora was a retaliatory strike against those American forces intending to ignite a Global War with attacks upon the Iranian Nation. These latest events come as the Asia Times News Service is reporting that “a retired US career diplomat and former assistant secretary of state still active in the foreign affairs community” has informed them that the US War Leaders fully plan on attacking Iran within the next two months. Efforts to stop the Americans from starting a Total Globe War appear to be diminishing by the hour as the United States has become increasingly erratic as its economy continues its downward death spiral plagued by rapidly rising fuel and food prices, a collapsing housing market, massive layoffs of workers and a new government report warning of catastrophic changes to occur due to the effects of climate change battering that once great Nation. One can only wonder how different our World would be today if any of the American people acted upon their beliefs like the British activist, George Monbiot, who plans on making a citizens arrest of one of the top US War Leaders John Bolton, the former US ambassador to the United Nations and co-architect of the wars in Iraq and Afghanistan, for War Crimes. Sadly, however, there appears to be no will among the American people to stand up against their War Leaders as they plunge the World into ever greater conflict and mass destruction. To the Orwellian nightmare the United States has become, new reports are stating that US Military Forces are now developing “Environmentally Friendly Bombs”, and which one could only hope would lead to people friendly ones being built too. © May 28, 2008 EU and US all rights reserved.